© Anderson Design Group, Inc. Used by permission. 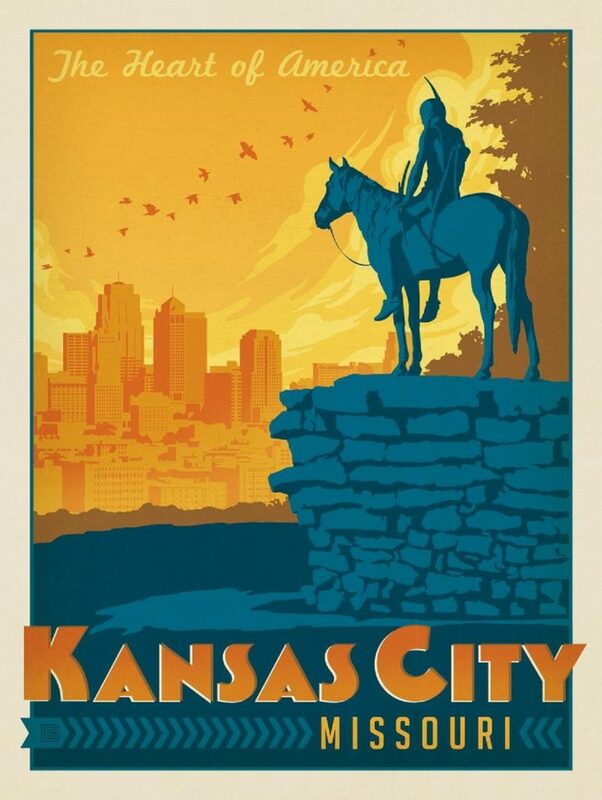 If you like this art depicting the Kansas City Scout, click on the picture above to buy it at the Anderson Design Group’s website. Kansas City straddles the Missouri-Kansas state line which sometimes can be confusing! If you are west of the state line you are in Kansas; if you are east of the state line you are in Missouri. No matter which side of the line you find yourself, there are lots of things to see, food to eat, art to experience, sports to cheer and a good time to be had! We hope you take the time to visit our city and understand why we love this place. As to the debate over which state we prefer, Kansas or Missouri, well, that’s probably never going to be settled. Check out our list of Things to Do and have a great time in Kansas City! Check out the Visit KC website for current events happening in our city! BBQ: This is a hotly contested subject here in KC going all the way back to the 1920’s but some of our favorites are Arthur Bryant’s, Gates, Joe’s Kansas City (yes, it really is in a gas station) and Fiorella’s Jack Stack . Need more bbq? Check out a tour and branch out to other hidden spots in Kansas City! Shopping: Need to do some serious shopping? Come and visit the Country Club Plaza, stop in at Crown Center , check out Brookside or, if you’re looking for something a little more edgy, visit the West Bottoms for First Weekends and pick up a great vintage find! Sports: From college basketball, professional and minor league baseball, motor sports, soccer, professional football and ice hockey we have a lively sporting scene going on in and around Kansas City. Check out the Events page at VisitKC for a list of current sporting events. Art: Kansas City has a dynamic art culture with many galleries and museums including the Crossroads Art District, the Nelson Atkins museum, the Kemper Museum, and Artspace among others. History: From Jesse James to Jazz, Kansas City has a lot of history. Visit the national WWI memorial, 18th and Vine district, the Arabia Steamboat Museum, and of course cars at the KC Automotive Museum.